Anonymous, 29 Jun 2015If more cores are not better why do Apple uses dual core? Stick to 1 core with 512mb of ram th... moreThen what is the use of having a 10 core if the number of cores being used is almost a half of it? What would those idle cores do? AnonD-322352, 29 Jun 2015"Why only four cores when 10-core models are headed to market? Well, this has turned into... moreWhat can't a triple, quad, and an octa core run? Almost all phones on android are either dual core, a quad core, and even an octa core. Apple themselves are using dual cores. Now in the process of moving to a triple core processor. Which could be placed on the upcoming devices this year. A deca core is only good for show offs. But IRL. You can't even use all the cores. Anonymous, 29 Jun 2015If more cores are not better why do Apple uses dual core? Stick to 1 core with 512mb of ram th... moreThere is a difference between upgrading for performance/efficiency and going crazy for marketing.. Mediatek has come out with a 10 core processor if you aren't aware.. Now compare..
AnonD-281598, 29 Jun 2015clocked @ 1.5 / 1.55 ghz compare to 2.1 ghz of Exynos. I think it is good. When test Exynos 7420. it's only show clock @ 1.5GHz. Search google for detail. AnonD-376219, 29 Jun 2015You have no idea what your talking about. more cores will save a lot on battery life and multi... moreYou realise you just compared a 1810mah battery of iphone 6 with 3350mah of mx4 pro while quoting the number of hours of web browing and then used it to make a conclusion about 'core setup' efficiency? What a shame... I'm huge fan of android, but apple are leading the mobile processor performace in single core... Android is loosing ground in the future gaming and heavy productive mobile apps. sa11oum, 29 Jun 2015"Close" to the 7420, which has been on the market for 3 months now? 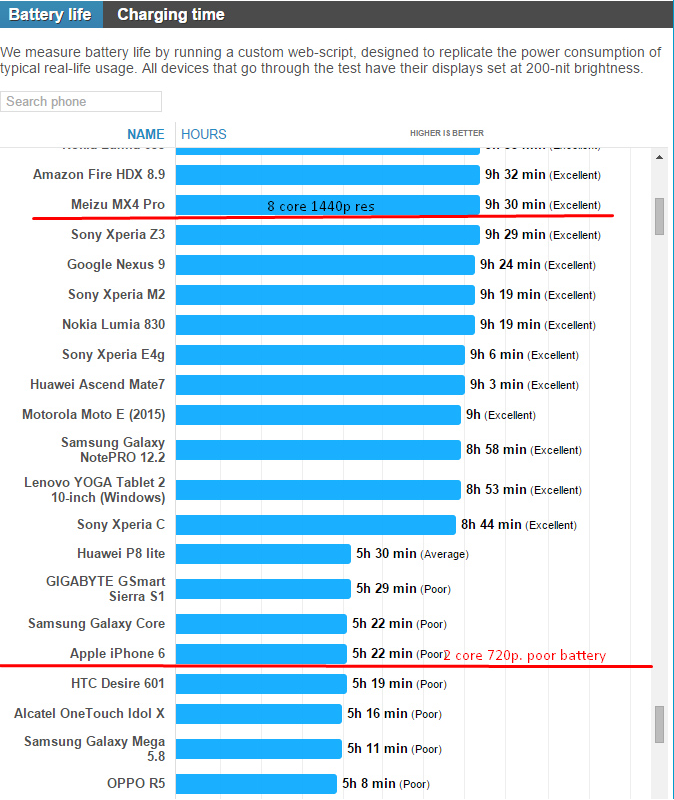 Qualcomm is head... moreKnowing Qual this is benchmarked in a dev kit,anyone remember the high 810 pre-release scores. And i just sit here waiting for microsoft launching the new flagship. Its been forever, i cant wait. Am i the only one? sa11oum, 29 Jun 2015"Close" to the 7420, which has been on the market for 3 months now? Qualcomm is head... moreYou do realise that they are yet to benchmark the GPU, don't you? AnonD-294135, 29 Jun 2015to be fair though if you have a correctly programed program more cores can be useful though mo... moreExactly. Can we fry eggs on it...? Anyone got the link to the result? Geekbench doesnt work unless you upload the result, so without that it cant be real. 4-Cores? Sweet, the return of the Quad-cores on F/S phones. AnonD-376219, 29 Jun 2015You have no idea what your talking about. more cores will save a lot on battery life and multi... moreDid I say anything about iPhone in my previous statement? No. Did I say anything about battery life efficiency in my previous statement? No. Why are you suddenly jumping into conclusion that I was defending iPhone? Additionally, iPhones are infamous of having small batteries. The outdated LCD tech display also doesn't help in the battery life department. The low core amount isn't even related to its battery life. Anonymous, 29 Jun 2015If more cores are not better why do Apple uses dual core? Stick to 1 core with 512mb of ram th... moreWhy intel is still using quad core i7? Why still running i74770K with quad core??? The years of the PC era, octa cores are unheard of from Intel, its only AMD chip that comes with those stupid 12 core apus. See who is on top of performance??? Why would you need octa core?? You running server programs?? Its all marketing gimmick.. They cannot create architecture good enough to VS Apple's A chipset, so they stack it with cores to make numbers bigger, but you know the problem.. YOur android phone LAGS. Cores have diminishing returns as you get as more. If you get beyond quad core, its already a gimmick.